In this article I introduced MoveObjectBehavior and a way to use it to make Facebook-app like scroll-into-view panes. All very nice, but with a minor drawback – it basically needs a fixed screen size. 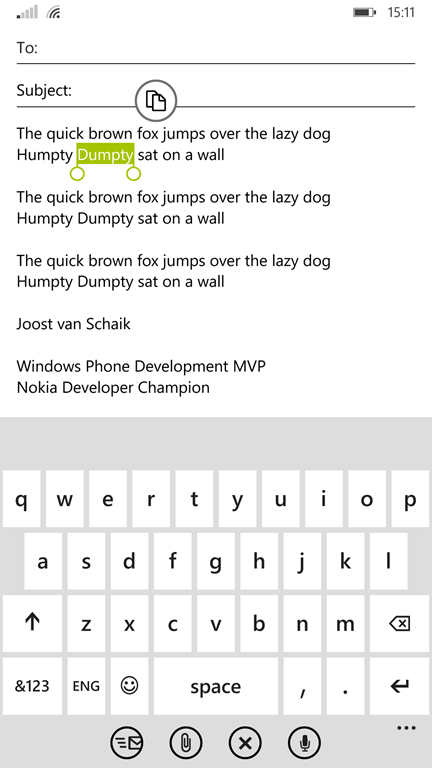 That’s OK under Windows Phone 8 (albeit it does not look so good on a Lumia 1520) but still – you got away with it. That is no longer the case in Windows Phone 8.1, and it never was the case in Windows 8. You have to take multiple screen sizes into account now, and in the case of Windows 8 the screen size can change while the app is running – as the user can arbitrarily change the horizontal space an app is using while it’s running. Now MoveObjectBehavior has an ActivatedXValue Property and of course I could try, in stead of setting a fixed value, to bind that to the value of ActualWidth of the Page. Unfortunately that is not a Dependecy Property, so although it works initially, changes to it’s value are not populated. Yet, as you can see above, it can be done, and with a pretty animation as well. It is very simple - it listens to the SizeChanged event that does get triggered on any size change, then populates that to two dependency properties. And those are bindable. I omitted both properties from the code above as they are fairly standard. So if you give the behavior a name you can use Element binding to bind this properties to MoveObjectBehavior. You see the parts that are actually do the work underlined, red and bold (so I hope that this is clear for everyone, even color blind people). The trick with the mirroring grids to put stuff to the left (and the right) of your screen is described in my article, Aligning XAML elements outside the screen using scaling (for a Facebook-like GUI), so I won’t repeat that here. The demo solution can be found here. If you are looking for the source in the code, you can keep looking, as it’s been sitting in my WpWinNl library on CodePlex for a while – but I just did not have the time to blog about it. If you want just the behavior’s source, that’s here. 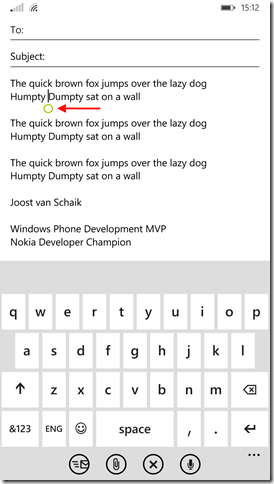 Windows Phone 8.1–moving your cursor. Don’t panic! Then swipe a little down and move the cursor to the place where you actually want it to be. Tap the word again. This will deselect it again, place the cursor in front of it, with a single dot-handle below it. Now tap on that dot and move your finger around. The cursor will follow your finger – even up and down. It’s displayed in your phone’s accent color – mine is currently set to lime green. I find that kind of fitting with spring, don’t you think? ;-). Once you are used to it, it’s really easy. Double-tap, move the cursor. No more long pressing and swiping down. For those who rather see it explained on video: see below. How to move your cursor. Let me make one thing clear: no-one is going to push you. Windows Phone 8.1, like it’s predecessor, will run 8.0 apps fine. 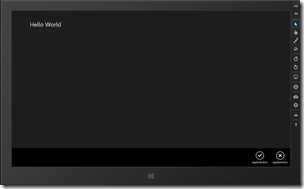 You can go on re-using the skillset you have acquired, still using the XAML style you are used to. In fact, Microsoft stresses this point even more by including Windows Phone Silverlight 8.1 apps, which are a bit of a halfway station: your XAML largely stays the same, but it gives you access to the new APIs. Yet I feel the crown jewel of the new SDK is the new Universal Windows app and, in it’s slipstream, the enhanced PCL capabilities. But once again – no-one is forcing you this way. Microsoft are very much about going forward, but also about protecting your existing skills and assets. One thing up front: ‘one app that runs everywhere’ is a station that we still have not reached. 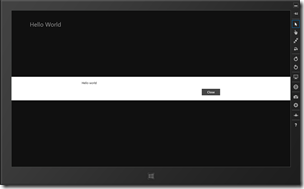 You are still making two apps – one for Windows Phone, one for Windows. In this sense, it’s basically the same approach as before where you used code sharing with linked files. That was quite a hassle, and now Visual Studio supports a formal way to share files between projects. This makes maintaining oversight dramatically easier, and it gets rid of the confounded “This document is opened by another project’ dialog too. 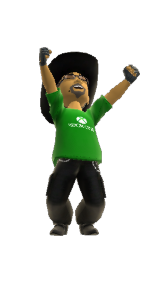 Plus – and that’s a very big plus – the code you can use on both platforms has become a lot more similar. 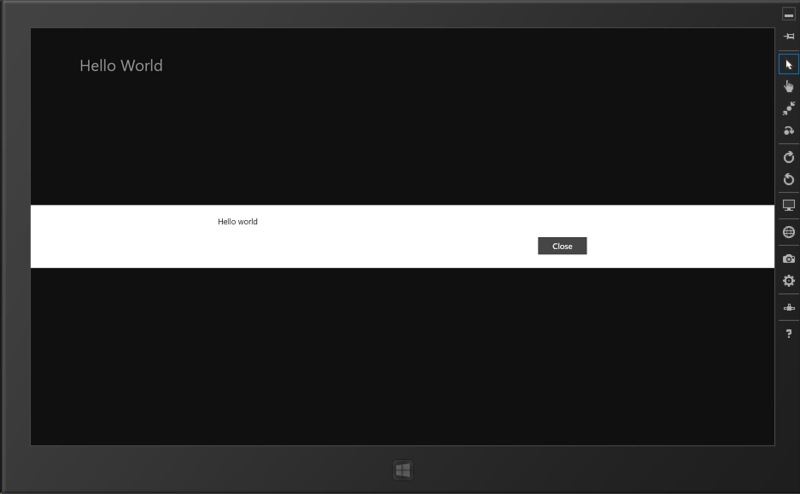 One warning in advance – if you going for the Universal Windows app, you’re going all the way. It means that for your Windows Phone app in most cases you are basically writing a Windows 8 app - using XAML and APIs that are familiar for Windows Store apps programmers, but not necessarily for Windows Phone developers. If you already have some experience writing Windows Store this won’t be a problem. If you have never done that before, some things may look a bit different. 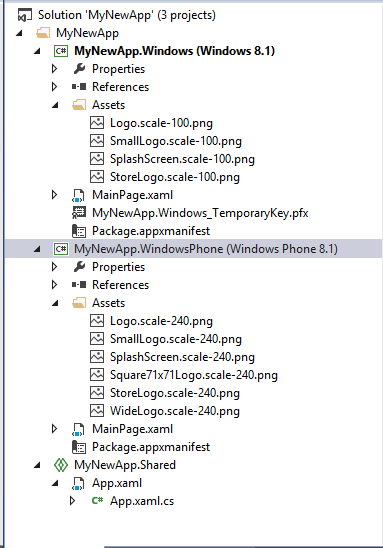 If you go through the shared App.Xaml.cs you will notice a few more things: at several places in the file it says #if WINDOWS_PHONE_APP, and I also want to point out this little thing on top, the context switcher. And added some code behind. Now this may seem pretty cool – and in fact it is - but it would not be something I would recommend using just like that. Windows Phone is a different beast, the way people use a phone app differs from how they use a Store app on a tablet, and usually you have to think different about how the layout works on a tablet. 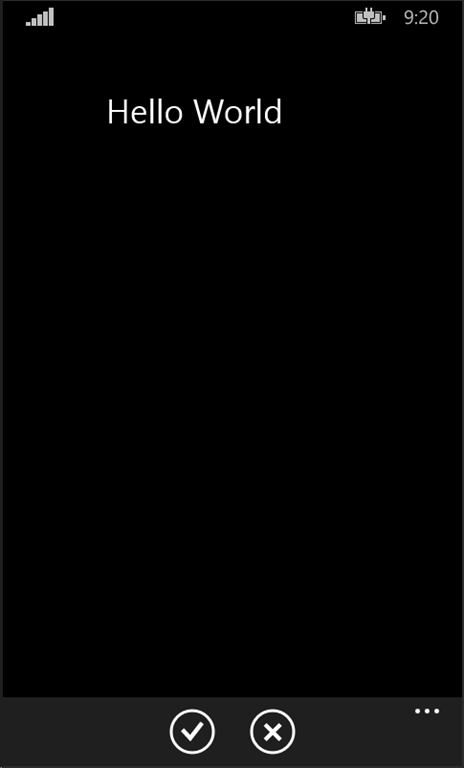 Case in point – the app bar. 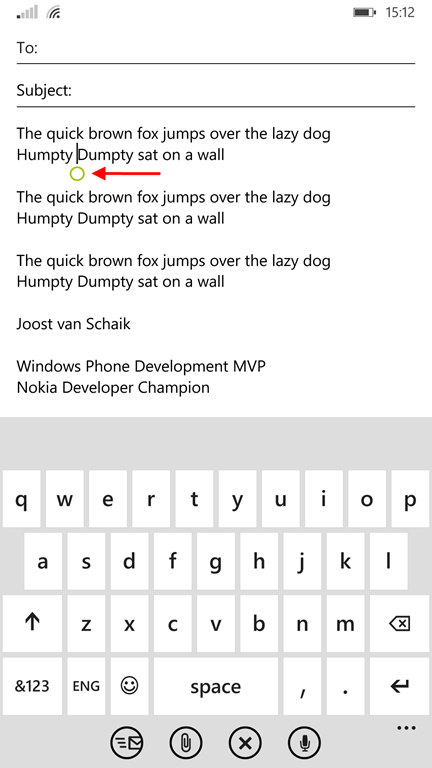 Windows Phone has only room for four buttons. The Secondary Commands show up as menu items, not as buttons. The Top bar does not show up at all. 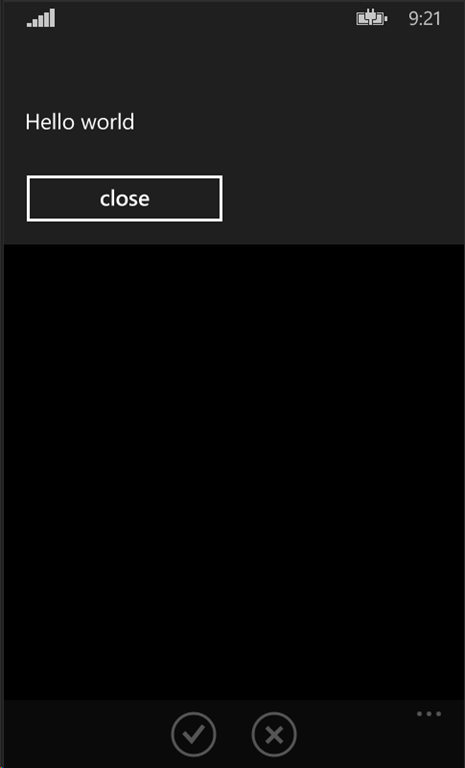 So blindly copying a UI from Windows Phone to Windows Store and back is not a smart thing to do. But the fact that it works, is in itself pretty cool. Phone design does not always translate easily to tablet design and vice versa (as pointed out above). To maximize code sharing, you can for instance use partial classes. 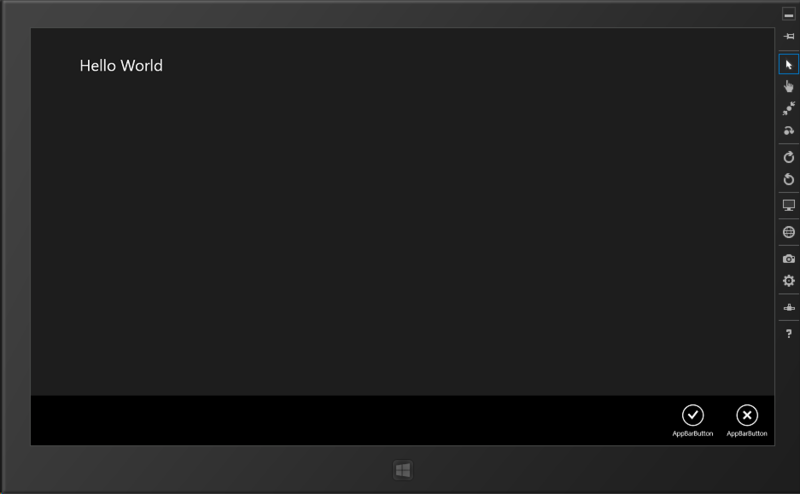 That works like this: in your code behind MainPage.Xaml.cs you declare the class “partial”. And this still gives the same result. Partial classes in shared projects can be pretty powerful. From the partial class in shared code you can call for instance back to methods in the non-shared portion, provided that those called methods are present in both the non-shared portions of the class (so both the MainPage.Xaml.cs). You can even call methods in referenced PCLs. Just keep in mind that in the background it just works like shared files and you can do a lot to minimize duplication. 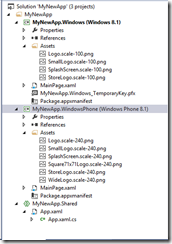 Another way of sharing code is putting most of it in the shared portion – even stuff that’s not present on both platforms – but then using the #ifdef WINDOWS_PHONE_APP and #ifdef WINDOWS_APP directives. This is largely a matter of preference. For smaller classes with little differences I tend to choose this route, for larger classes or code behind files I tend to go for partial classes.When I am working on stuff that is particularly phone-related, I don’t want my code cluttered by Windows code, and vice versa. A third way of sharing pieces of UI would be creating user controls in shared code. They can be reused within pages that are in itself not shared. In the past, I have never been a fan of PCL, because of their limitations. This has been greatly improved by the new model and I actually start to like it. If you make a PCL for use in Windows 8.1 and Windows Phone 8.1 you can put almost everything in it that can be stuffed in a shared project, including user controls – although of course you can’t do elaborate partial classes callback tricks into non-shared code. This is because a PCL needs to stand on itself. So only everything that is available in both platforms fits in, so for instance almost everything map-related is out (with a few notable and very important exceptions: Geolocation (GPS tracking) and Geofencing (that is now available on Windows Phone too!). Build for Both has become a lot easier. You still have to deliver two apps, but making them as one has become a lot easier. Making clever use of the of partial classes and #ifdef makes it easier too, although this requires some thinking. Still, you have to take into account how both platforms behave differently. 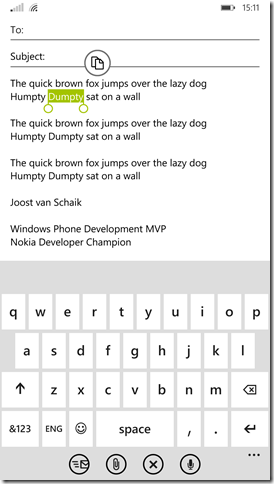 A new exiting story for Windows Phone and Windows developers has begun. The ‘demo solution’, which is hardly worth it’s name in this case, can be downloaded here.